EARN recently began leveraging the CFSI Financial Health Score® Toolkit. The scores give EARN insights into aspects of Savers’ financial lives beyond savings, including attitudes towards spending, debt, abilities to weather financial shocks, and to plan for financial futures. 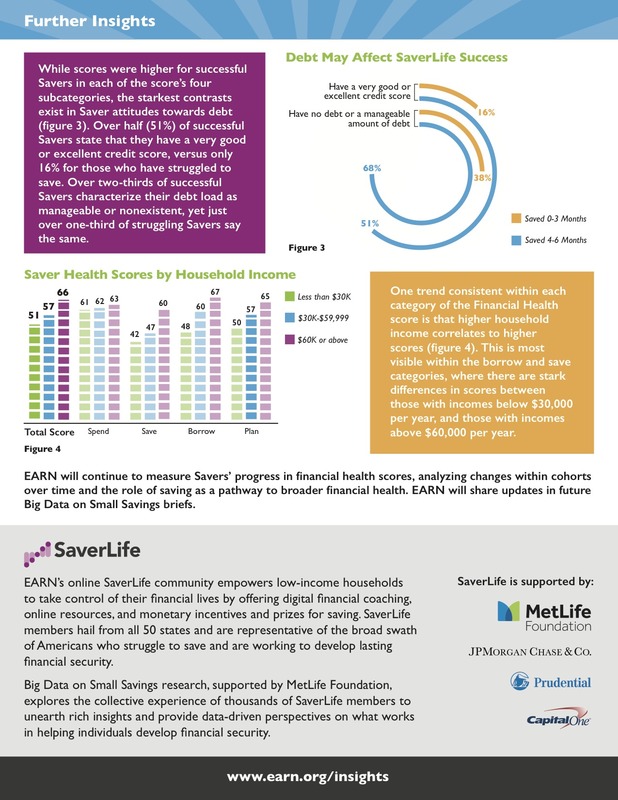 SaverLife Saver financial health scores trail national averages in each of the score’s four subcategories of spend, save, borrow, and plan (see figure 1). In fact, 30% of EARN’s Savers are classified by CFSI as “Vulnerable,” while 53% are “Coping.” Only 17% of Savers are considered “Healthy.” This is not surprising since EARN strives to help low- to moderate-income households. While it is too early to claim a causal relationship, EARN found a strong correlation between higher financial health scores and success in the SaverLife match program, defined here as saving $20 in at least three of their first six months in SaverLife (figure 2). While scores were higher for successful Savers in each of the score’s four subcategories, the starkest contrasts exist in Saver attitudes towards debt (figure 3). Over half (51%) of successful Savers state that they have a very good or excellent credit score, versus only 16% for those who have struggled to save. Over two-thirds of successful Savers characterize their debt load as manageable or nonexistent, yet just over one-third of struggling Savers say the same. One trend consistent within each category of the Financial Health score is that higher household income correlates to higher scores (figure 4). This is most visible within the borrow and save categories, where there are stark differences in scores between those with incomes below $30,000 per year, and those with incomes above $60,000 per year. 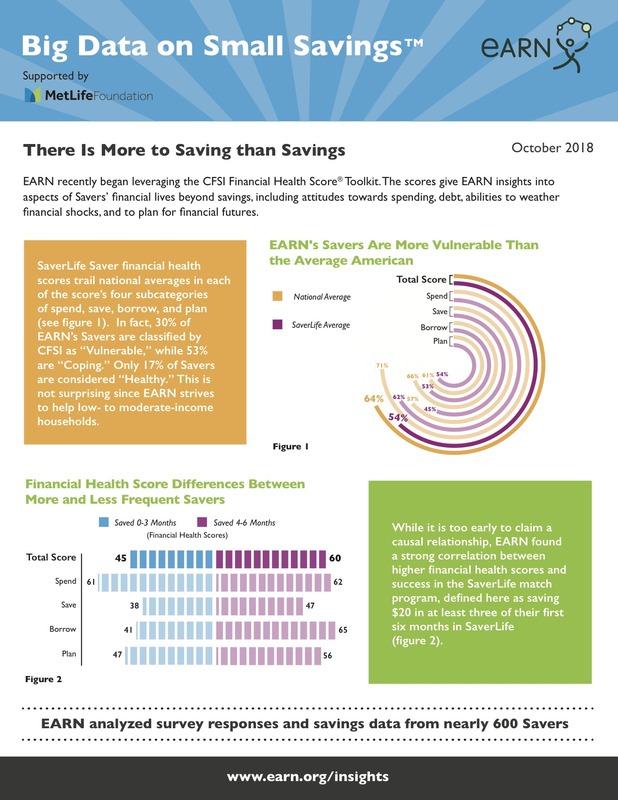 EARN will continue to measure Savers’ progress in financial health scores, analyzing changes within cohorts over time and the role of saving as a pathway to broader financial health. EARN will share updates in future Big Data on Small Savings briefs.